The CosmoSim webpage provides access to several cosmological simulations, with a separate database for each simulation. Their main parameters are summarized in the table below for comparison. Please click on the name of a simulation to get more detailed information (if available). The name given in the table is the name of the database; alternative names for the simulations are shown in grey. 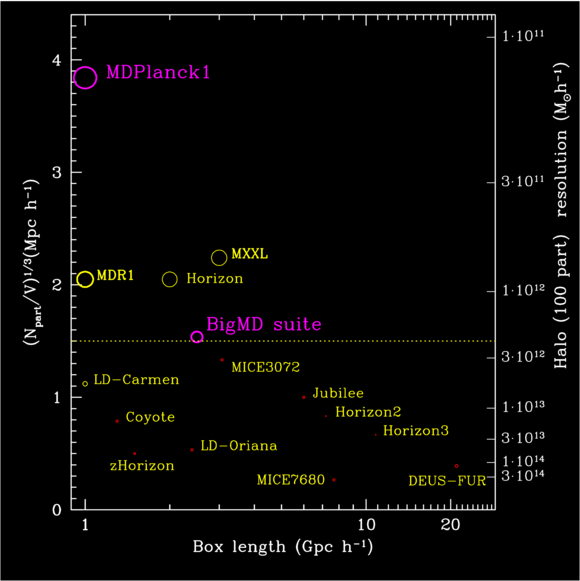 The minimum halo mass is the mass of a halo containing 20 particles; the maximum halo mass is taken from the most massive BDMW halo or FOF group (for BigMD-simulations), to give an impression of the mass resolution and scale. Substructure: substructure information, i.e. links between halos and subhalos etc. The simulations are completed, but it will still take some time until all the catalogues are created, prepared for publishing, and uploaded into the database. Please be patient and visit again from time to time to check the status!